Instead of attempting to create miniature robots as spies, researchers are now experimenting with developing insect cyborgs or "cybugs" that could work even better. So far scientists can already control the flight of moths using implanted devices. The military and spy world no doubt would love tiny, live camera-wielding versions of Predator drones that could fly undetected into places where no human could ever go to snoop on the enemy. Developing such robots has proven a challenge so far, with one major hurdle being inventing an energy source for the droids that is both low weight and high power. Still, evidence that such machines are possible is ample in nature in the form of insects, which convert biological energy into flight. It makes sense to pattern robots after insects — after all, they must be doing something right, seeing as they are the most successful animals on the planet, comprising roughly 75 percent of all animal species known to humanity. Indeed, scientists have patterned robots after insects and other animals for decades — to mimic cockroach wall-crawling, for instance, or the grasshopper's leap. Instead of attempting to create sophisticated robots that imitate the complexity in the insect form that required millions of years of evolution to achieve, scientists now essentially want to hijack bugs for use as robots. Originally researchers sought to control insects by gluing machinery onto their backs, but such links were not always reliable. To overcome this hurdle, the Hybrid Insect Micro-Electro-Mechanical Systems program is sponsoring research into surgically implanting microchips straight into insects as they grow, intertwining their nerves and muscles with circuitry that can then steer the critters. As expensive as these devices might be to manufacture and embed in the bugs, they could still prove cheaper than building miniature robots from scratch. As these cyborgs heal from their surgery while they naturally metamorphose from one developmental stage to the next — for instance, from caterpillar to butterfly — the result would yield a more reliable connection between the devices and the insects, the thinking goes. The fact that insects are immobile during some of these stages — for instance, when they are metamorphosing in cocoons — means they can be manipulated far more easily than if they were actively wriggling, meaning that devices could be implanted with assembly-line routine, significantly lowering costs. * Roaches at Texas A&M. * Horned beetles at University of Michigan and the University of California at Berkeley. * Moths at an MIT-led team, and another moth project at the Boyce Thompson Institute for Plant Research. 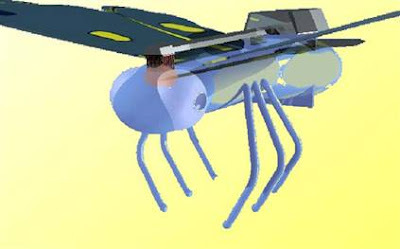 So far researchers have successfully embedded MEMS into developing insects, and living adult insects have emerged with the embedded systems intact, a DARPA spokesperson told LiveScience. Researchers have also demonstrated that such devices can indeed control the flight of moths, albeit when they are tethered. To power the devices, instead of relying on batteries, the hope is to convert the heat and mechanical energy the insect generates as it moves into electricity. The insects themselves could be optimized to generate electricity. When the researchers can properly control the insects using the embedded devices, the cybugs might then enter the field, equipped with cameras, microphones and other sensors to help them spy on targets or sniff out explosives. Although insects do not always live very long in the wild, the cyborgs' lives could be prolonged by attaching devices that feed them.